“Information and structure in complex systems,” Plektix (24 October 2014). “An Information-Theoretic Formalism for Multiscale Structure in Complex Systems,” arXiv:1409.4708 [cond-mat.stat-mech]. Multiscale Structure in Eco-Evolutionary Dynamics, arXiv:1509.02958 [q-bio.PE]. In this post, I’ll carry the ideas laid out in these sources a little bit farther in a particular direction. B. C. Stacey, “Geometric and Information-Theoretic Properties of the Hoggar Lines” (2016), arXiv:1609.03075 [quant-ph]. We take a tour of a set of equiangular lines in eight-dimensional Hilbert space. This structure defines an informationally complete measurement, that is, a way to represent all quantum states of three-qubit systems as probability distributions. Investigating the shape of this representation of state space yields a pattern of connections among a remarkable spread of mathematical constructions. In particular, studying the Shannon entropy of probabilistic representations of quantum states leads to an intriguing link between the questions of real and of complex equiangular lines. Furthermore, we will find relations between quantum information theory and mathematical topics like octonionic integers and the 28 bitangents to a quartic curve. All things told, SIC-POVMs are just about the damnedest things I’ve ever studied in mathematics. B. Allen, B. C. Stacey and Y. Bar-Yam, “An Information-Theoretic Formalism for Multiscale Structure in Complex Systems” [arXiv:1409.4708]. We develop a general formalism for representing and understanding structure in complex systems. In our view, structure is the totality of relationships among a system’s components, and these relationships can be quantified using information theory. In the interest of flexibility we allow information to be quantified using any function, including Shannon entropy and Kolmogorov complexity, that satisfies certain fundamental axioms. Using these axioms, we formalize the notion of a dependency among components, and show how a system’s structure is revealed in the amount of information assigned to each dependency. We explore quantitative indices that summarize system structure, providing a new formal basis for the complexity profile and introducing a new index, the “marginal utility of information”. Using simple examples, we show how these indices capture intuitive ideas about structure in a quantitative way. Our formalism also sheds light on a longstanding mystery: that the mutual information of three or more variables can be negative. We discuss applications to complex networks, gene regulation, the kinetic theory of fluids and multiscale cybernetic thermodynamics. A post today by PZ Myers nicely expresses something which has been frustrating me about people who, in arguing over what can be a legitimate subject of “scientific” study, play the “untestable claim” card. Their ideal is the experiment that, in one session, shoots down a claim cleanly and neatly. So let’s bring in dowsers who claim to be able to detect water flowing underground, set up control pipes and water-filled pipes, run them through their paces, and see if they meet reasonable statistical criteria. That’s science, it works, it effectively addresses an individual’s very specific claim, and I’m not saying that’s wrong; that’s a perfectly legitimate scientific experiment. I’m saying that’s not the whole operating paradigm of all of science. Plenty of scientific ideas are not immediately testable, or directly testable, or testable in isolation. For example: the planets in our solar system aren’t moving the way Newton’s laws say they should. Are Newton’s laws of gravity wrong, or are there other gravitational influences which satisfy the Newtonian equations but which we don’t know about? Once, it turned out to be the latter (the discovery of Neptune), and once, it turned out to be the former (the precession of Mercury’s orbit, which required Einstein’s general relativity to explain). There are different mathematical formulations of the same subject which give the same predictions for the outcomes of experiments, but which suggest different new ideas for directions to explore. (E.g., Newtonian, Lagrangian and Hamiltonian mechanics; or density matrices and SIC-POVMs.) There are ideas which are proposed for good reason but hang around for decades awaiting a direct experimental test—perhaps one which could barely have been imagined when the idea first came up. Take directed percolation: a simple conceptual model for fluid flow through a randomized porous medium. It was first proposed in 1957. The mathematics necessary to treat it cleverly was invented (or, rather, adapted from a different area of physics) in the 1970s…and then forgotten…and then rediscovered by somebody else…connections with other subjects were made… Experiments were carried out on systems which almost behaved like the idealization, but always turned out to differ in some way… until 2007, when the behaviour was finally caught in the wild. And the experiment which finally observed a directed-percolation-class phase transition with quantitative exactness used a liquid crystal substance which wasn’t synthesized until 1969. You don’t need to go dashing off to quantum gravity to find examples of ideas which are hard to test in the laboratory, or where mathematics long preceded experiment. (And if you do, don’t forget the other applications being developed for the mathematics invented in that search.) Just think very hard about the water dripping through coffee grounds to make your breakfast. A. Franceschini et al. (2011), “Transverse Alignment of Fibers in a Periodically Sheared Suspension: An Absorbing Phase Transition with a Slowly Varying Control Parameter” Physical Review Letters 107, 25: 250603. DOI: 10.1103/PhysRevLett.107.250603. Abstract: Shearing solutions of fibers or polymers tends to align fiber or polymers in the flow direction. Here, non-Brownian rods subjected to oscillatory shear align perpendicular to the flow while the system undergoes a nonequilibrium absorbing phase transition. The slow alignment of the fibers can drive the system through the critical point and thus promote the transition to an absorbing state. This picture is confirmed by a universal scaling relation that collapses the data with critical exponents that are consistent with conserved directed percolation. Last October, a paper I co-authored hit the arXivotubes (1110.3845, to be specific). This was, on reflection, one of the better things which happened to me last October. (It was, as the song sez, a lonesome month in a rather immemorial year.) Since then, more relevant work from other people has appeared. I’m collecting pointers here, most of them to freely available articles. I read this one a while ago in non-arXiv preprint form, but now it’s on the arXiv. M. Raghib et al. (2011), “A Multiscale maximum entropy moment closure for locally regulated space-time point process models of population dynamics”, Journal of Mathematical Biology 62, 5: 605–53. arXiv:1202.6092 [q-bio]. Abstract: The pervasive presence spatial and size structure in biological populations challenges fundamental assumptions at the heart of continuum models of population dynamics based on mean densities (local or global) only. Individual-based models (IBM’s) were introduced over the last decade in an attempt to overcome this limitation by following explicitly each individual in the population. Although the IBM approach has been quite insightful, the capability to follow each individual usually comes at the expense of analytical tractability, which limits the generality of the statements that can be made. For the specific case of spatial structure in populations of sessile (and identical) organisms, space-time point processes with local regulation seem to cover the middle ground between analytical tractability and a higher degree of biological realism. Continuum approximations of these stochastic processes distill their fundamental properties, but they often result in infinite hierarchies of moment equations. We use the principle of constrained maximum entropy to derive a closure relationship for one such hierarchy truncated at second order using normalization and the product densities of first and second orders as constraints. The resulting `maxent’ closure is similar to the Kirkwood superposition approximation, but it is complemented with previously unknown correction terms that depend on on the area for which third order correlations are irreducible. This region also serves as a validation check, since it can only be found if the assumptions of the closure are met. Comparisons between simulations of the point process, alternative heuristic closures, and the maxent closure show significant improvements in the ability of the maxent closure to predict equilibrium values for mildly aggregated spatial patterns. The question came up while discussing the grand canonical ensemble the other day of just where the word fugacity came from. Having a couple people in the room who received the “benefits of a classical education” (Gruber 1988), we guessed that the root was the Latin fugere, “to flee” — the same verb which appears in the saying tempus fugit. Turns out, the Oxford English Dictionary sides with us, stating that fugacity was formed from fugacious plus the common +ty suffix, and that fugacious (meaning “apt to flee away”) goes back to the Latin root we’d guessed. Gilbert N. Lewis appears to have introduced the word in “The Law of Physico-Chemical Change”, which appeared in the Proceedings of the American Academy of Arts and Sciences 37 (received 6 April 1901). On occasion, somebody voices the idea that in year [tex]N[/tex], physicists thought they had everything basically figured out, and that all they had to do was compute more decimal digits. I won’t pretend to know whether this is actually true for any values of [tex]N[/tex] — when did one old man’s grumpiness become the definitive statement about a scientific age? — but it’s interesting that not every physicist with an interest in history has supported the claim. In the wake of ScienceOnline2011, at which the two sessions I co-moderated went pleasingly well, my Blogohedron-related time and energy has largely gone to doing the LaTeXnical work for this year’s Open Laboratory anthology. 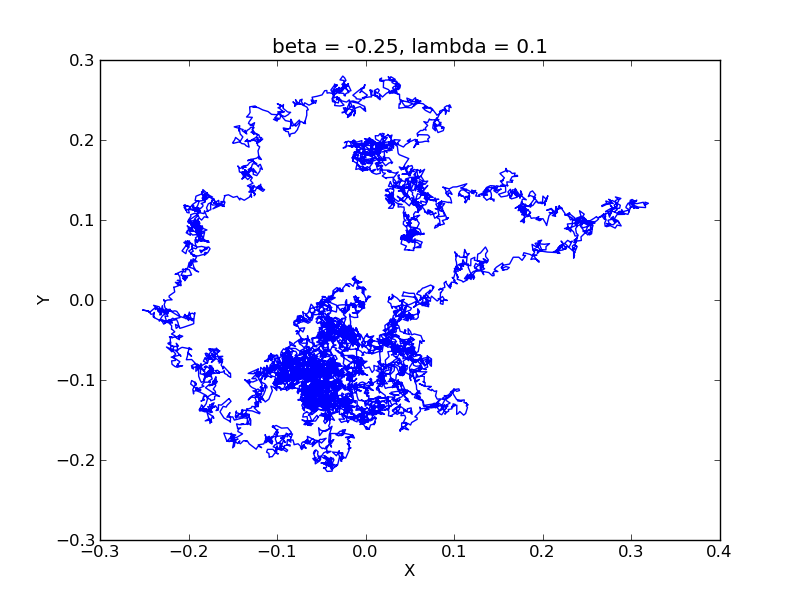 I have also made a few small contributions to the Azimuth Project, including a Python implementation of a stochastic Hopf bifurcation model. I continue to fall behind in writing the book reviews I have promised (to myself, if to nobody else). At ScienceOnline, I scored a free copy of Greg Gbur’s new textbook, Mathematical Methods for Optical Physics and Engineering. Truth be told, at the book-and-author shindig where they had the books written by people attending the conference all laid out and wrapped in anonymizing brown paper, I gauged which one had the proper size and weight for a mathematical-methods textbook and snarfed that. On the logic, you see, that if anyone who was not a physics person drew that book from the pile, they’d probably be sad. (The textbook author was somewhat complicit in this plan.) I am happy to report that I’ve found it a good textbook; it should be useful for advanced undergraduates, procrastinating graduate students and those seeking a clear introduction to techniques used in optics but not commonly addressed in broad-spectrum mathematical-methods books.